I’ve written several times about bicycle lighting on this blog. You may have read them, if not you can go back and see what I wrote. As with most technology, it is moving forward every year, and bicycle lights are no exception. I’m currently waiting for the arrival of a new tail light for my trike. The Cateye Reflex Auto is the newest addition to my lighting stable. It’s not the best, or the most expensive bike tail light, but it represents a significant step forward in bike lights for a few reasons. 1. It is a combination tail light and CPSC* passive reflector. That means that even if it is not on, it is a reflector just like the cheap ones that come on your bike. It will reflect light from an automobile straight back to the auto with high efficiency, making you visible using the light from the car’s own headlights. Not high-tech, but a simple addition that has usually been overlooked in LED tail lights. But since most people remove the passive reflector to use it’s mounting point for their LED tail light, it’s a glaring oversight. * CPSC is the acronym for Consumer Product Safety Commission, the group that mandated reflectors be installed on every bike sold in the US. Their application is the minimal effort at bike visibility in dark conditions and most state’s vehicle laws are tailored to something close to this. 2. It is a very affordable LED light, being commonly available at around $25. Since it is made by Cateye, a major name in bicycle equipment (they make most of those CPSC reflectors) they have a wide distribution chain and are available from most bicycle shops. It is a fairly bright light that offers several flashing patterns that give runtimes up to 120 hours on a pair of standard AAA batteries. The combination of availability, cost and visibility make it a good choice for many people as a main tail light. 3. Cateye has made a leap into the future of bike lighting by making this light smart. It detects both light and motion, so it turns itself on whenever the bike is moving and it is dark. This doesn’t seem like much of a big deal, but it’s a big step forward in the safety of little Johnny if his parents put on his bike. Not only can’t he forget to turn it on, he doesn’t need to remember to turn it off, so those 120 hours of battery life will be used when they count, when Johnny is riding after dark. Now, the LucidBrake light that I reviewed before sort of did this as well, at least turning on and off automatically, but at a much greater cost. I think it’s a better all round tail light, and the brake light function is unique, but it is still not widely available. So, since it is so affordable, I ordered the Reflex Auto and am waiting for it to come in. My plan is to use it to replace the old Cateye TL-D1100 “Pineapple” light that is mounted under my rack just above the rear wheel. It’s the standard place where the original CPSC reflector was mounted. The TL-D1100 is a great light, unique in that it’s really two LED lights in one case. You can turn each set of lights on, off, or to different patterns independently. I don’t know what the purpose of that is* but it makes endless combinations of light patterns. And it is really bright for a traditional LED light. * I have heard the opinion expressed that a blinking light a.) makes it harder on a dark road to gauge distance of the bike rider and b.) that drunk drivers drive towards blinking lights. Perhaps the idea is to be able to run half the light steady on and the other half in a blinking pattern, thus getting the best of both. So the Reflex Auto will go on the rack where it will function only after dark while in motion. It will complement the DiNotte that I have mounted high and to the left, near back of my seat by my shoulder. I run this light whenever I am on any roadway, day or night. Incidentally, while I still swear by the DiNotte and will continue to use it as long as I can, there are now several 2 watt LED rear lights that ought to rival it for brightness at very good prices, under $50. The Cateye Reflex Auto is also available in a white version for mounting at the front of the bike. Not really a headlight, but it should beat a passive reflector easily for front visibility. I’m a believer in redundancy in bike lighting. There is something I like about riding after dark when it’s cooler, but only a fool would do it unprepared. With batteries being batteries, and going dead at the most inopportune times, I like to have a backup. I have two headlights, a Coleman LED flashlight in a bike holder and a 900 lumen li-ion powered light from China. The li-ion pack lasts a really long time, so I’m apt to use it for several rides without charging. That means I’m likely to run out of juice someday, even though it’s indicator light is supposed to warn you. I’ve had the TL-D1100 as a backup ever since I got the DiNotte. Sometimes I use both together. The Reflex Auto will make sure I’m always using both after dark. Video showing the Reflex compared to the DiNotte and TLD1100. The DiNotte on the left, is still the brightest. It’s one LED will get attention even in daylight. The TLD1100, sitting on top of the trunk bag, is pretty bright, but takes 6 big LEDs to do it. It’s a funky light with it’s pineapple shape and two-in-one format are unique. It’s well-built, but heavy. The Reflex, at the rack, is not as bright, but more than sufficient for night use. The usefulness of it’s automatic turn-on and passive reflector function outweigh any lack of brightness. It has a number of flash patterns, many of them that are really attention-getters. I still haven’t done any night riding with this light yet, but I remain convinced that it is a great all-round bicycle safety light. It may not be the brightest light, but it is far from the dimmest and does a very respectable job as an after-dark light, which is great, because it turns itself on then. The lack of raw intensity is mitigated by it’s entire surface lighting up, glowing, as it flashes. My favorite mode is one where it seems like it just shimmers from edge to edge. It is a real attention-getter, a attribute you want on a bike tail light. Cateye has really used it’s expertise in reflectors and plastic design to create a device that uses every lumen efficiently. While there is one central hot spot that puts out a lot of light, the rest of the light from the four auxilliary LEDS, is spread out and visible from side to side. And should your batteries die, it’s still a CPSC style corner-cube reflector. Many other lights claim some reflector capability, but none are edge-to-edge like the Reflex. I just bought a pair (red rear and white front) of them for my new bike, a HP Velo Street machine. The red light fits perfectly on the back rack where the original reflector was. There is a very good review of many bike tail lights at http://bicycles.blogoverflow.com/2013/09/best-bike-tail-lights-review/ which covers some of the newer lights as well as the standbys. I was interested to look at what might be available for a very bright daytime tail light. It seems like there is still no direct competition for the Dinottes, but the gap is closing and there are some possible alternatives in the sub-$50 range. More on the new bike in another post. Okay, time to get a little ranty. I’ve noticed what a lot of people are using on their bikes for rear/tail lights. Most are junk. First, don’t waste the money on any of those little, button-sized LED lights. You want to be seen, don’t you? 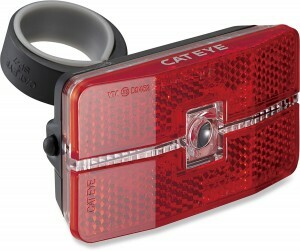 The Cateye Reflex Auto is the best all-round tail light for a number of reasons I already gave. But it’s not a daytime-bright rear light. It’s a very practical, cover your a$$ legally, light/reflector combination that, after dark, will make you very visible. If you expect to ride on the road during daylight hours, I recommend a really bright red rear LED light. It must be so bright that it is annoying to someone immediately behind you. The Dinotte lights are still the undisputed leader in this category, but are still overpriced. Many second-choice lights are almost this bright and useful in daylight conditions. Stick with something that specs a 1/2 watt, 1 watt, or 2 watt LED. That’s more important than whether it’s rechargeable or not. The higher the wattage LED, the brighter it is. Planet Bike, Princetontec, and Portland Design are among those that make lights in this category. Why not just keep using the TL-D1100, if it’s so bright and handy? Well, mainly, it’s size/weight. It’s a clunker of a light. If you put it in a sock and swung it, you could kill someone with it, using it as a club. I’m not joking, either. It’s that massive. So massive, in fact, that I have had it break and fall off my bike several times. I’ve bought replacement brackets from Cateye for it and I have had to fabricate replacement brackets on my rack for it. The original reflector bracket on the back of my Axiom rack broke where it bends and the vibration of holding this light eventually made it fatigue and break. My replacement aluminum angle bracket also broke and I went to mild steel after that. Yeah, this light is heavy. Side issue: Why do bike light manufacturers assume that lights will always be mounted to a seat post? Don’t they realize that sometimes people will want to mount to a horizontal bar? Especially recumbents? Cateye’s mounts have a square piece that slides into the back of their lights. Does it turn 90 deg? No. Why not? It does, but won’t lock in place. All it needs is little dimples for the locking mechanism. The Reflex is now mounted on the same bracket (same Cateye mounting bracket) and will never have that problem!